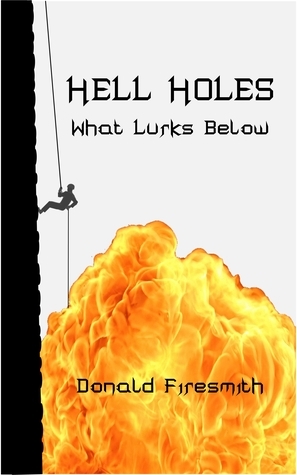 A geologist, his climatologist wife, two graduate students, a local newspaper reporter, an oil company representative, and a field biologist travel to one of dozens of huge holes that have mysteriously appeared in the tundra of the North Slope of Alaska. Their mission is to research these strange craters that threaten financial and environmental catastrophe should they open up under the Trans-Alaska Pipeline or any of the many oil wells and smaller pipe lines that feed it. Unfortunately, a far worse danger lurks below, one that threatens to destroy all of humanity when it finally emerges. Some will live and some will die on Hell Day and the day after as the team flees south towards Fairbanks. First let me say if you would like to get this book than you may get it free on Smashwords . So I read what the book was about and figured it was going about sink holes and maybe a new world down below. I have already read another book about sink holes so I figured let me see what this author is about. This isn’t sink holes this is something far more than that. There is another world opening up but it is one you don’t want to be around. So I got almost close to a half in this book and when I was thrown for a loop of the paranormal I was like what? Wasn’t expecting that and even though it was neat I started wanting to see more action without it feeling rushed. A team of scientist go out to determine what is causing these holes to open up near pipelines, but when they get there it is way more than they bargain for. Now it is a race against time to live and they have to put their lives in the hands of a reporter/mysterious person. We get to meet a lot of different paranormal entities in this book but this is where I felt it was rushed. We get it hit with one thing and we deal with that for a day or so (in the story they have to sleep some time), then it is like oh this is here and then this is here. It was like wow that was very quick. I have to say the ending left me wanting to throw my kindle (though I didn’t) it is a cliffhanger. I have to get book two because I need to see where this is going. By night and on weekends, his alter ego writes fantasy novels and relaxes by handcrafting magic wands from various magical woods and mystical gemstones. His first foray into fiction is the book Magical Wands: A Cornucopia of Wand Lore written under the pen name Wolfrick Ignatius Feuerschmied. He lives in Crafton, Pennsylvania with his wife Becky, and his son Dane, and varying numbers of dogs, cats, and birds.